The latest wedding trends are all about making a big impact with lavish lounges, stunning backdrops and that certain Great Gatsby-inspired touch. 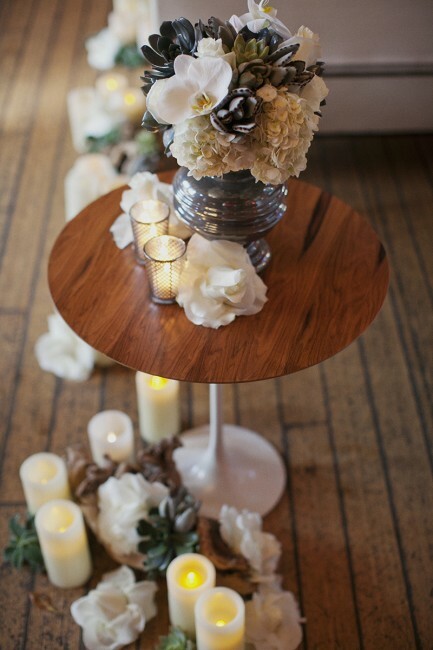 While we at FormDecor are big fans of glamorous nuptials and themed weddings, we know that a simplistic approach can translate into an elegant impact. If you are a bride or wedding planner who goes with the motto “less is more”, then this photo set will surely inspire you. Sterling Social and Be Inspired PR combined their creative bridal minds using modern design elements to play off the 1920s architecture in the Carondelet House in Los Angeles, giving this photo shoot an urban, modern day Gatsby vibe. These photos, taken by Stephanie Williams, are also featured in Magnolia Rogue Magazine, Green Wedding Shoes Blog and Inspired by This. Keep scrolling to see our favorites! 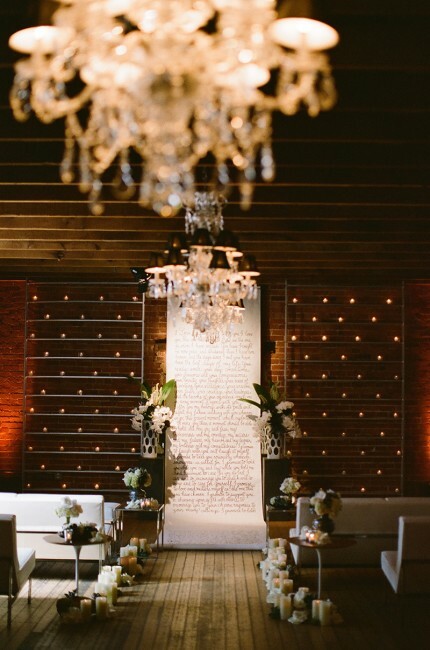 The combination of a glamorous chandelier, elegant backdrop, simple floral arrangements and mid-century modern furniture such as FormDecor’s Split Rail Sofa and Saarinen Tulip Side Table result in a unique, urban look to this ceremony. The words ‘mid-century’ and ‘elegant’ don’t always come up in the same sentence for most people, yet this floral display on FormDecor’s Saarinen Tulip Side Table truly shows how glamorous modern furniture can be. 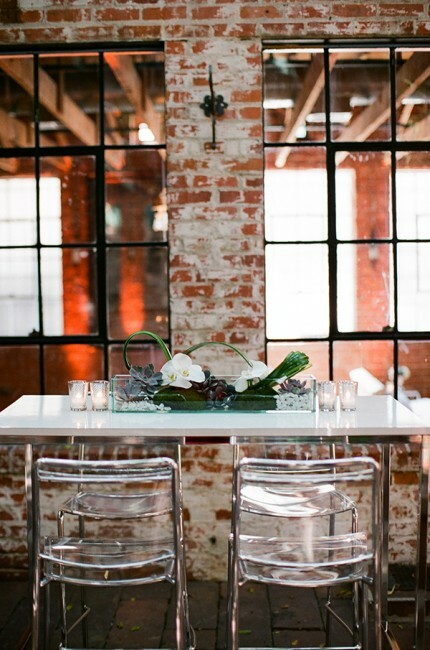 FormDecor’s Clarion Barstool and Bravo CR Bar Table against an exposed brick wall give this room a hip urban look, yet still keep it glamorous with the color palate and floral arrangements. 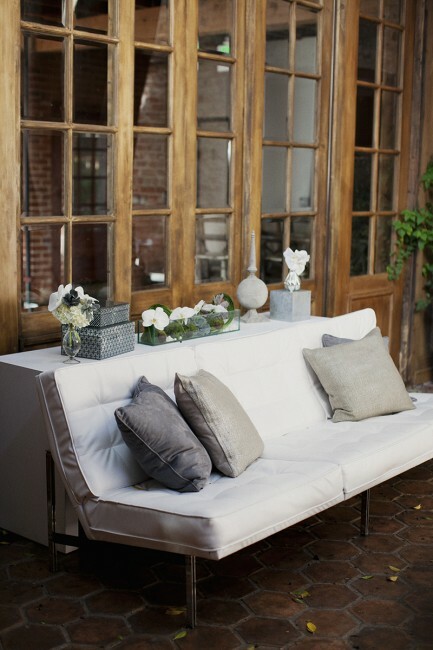 FormDecor’s Split Rail Sofa adds a perfect urban-chic touch to this venue from ceremony to reception, and beyond! The bride slips into something a little more comfortable for cocktail hour — FormDecor’s Cherner Arm Chair looks like it was made for this room. 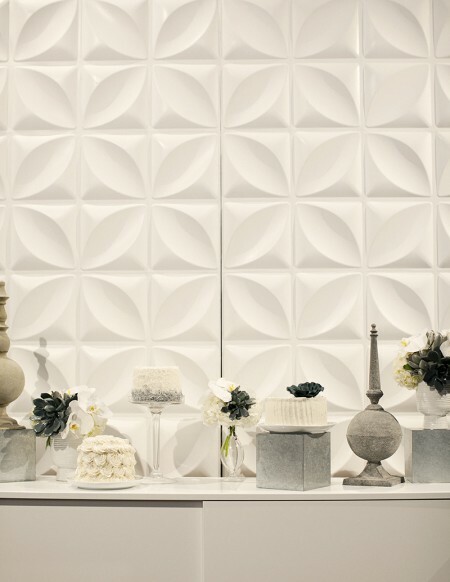 For an urban, mid-century look, FormDecor’s Chrysalis Screen was used as a backdrop for this delightful dessert display. We are in love with this bride’s simple yet stunning 1920s style as she sits on FormDecor’s Eames LaChaise Lounge Chair. We’re also on Facebook, Twitter and LinkedIn — so don’t forget to follow us there for the latest and greatest updates from FormDecor. This entry was posted in As Seen and Heard On..., FormDecor Weddings and tagged wedding furniture rentals, wedding furniture rentals in southern california, Mid-Century Modern, 1920s style wedding, how to use mid century furniture as wedding decor, mid century furniture in a bridal setting, mid century furniture made glam, stylized wedding shoot, the great gatsby themed wedding, urban wedding in los angeles, wedding inspiration, White wedding furniture. Bookmark the permalink. A Spring Wedding fit for Paris! FormDecor on Ace Hardware ‘Soul Paint’ Campaign! Our design consultants are here to help! Don’t OVERLOOK Our New Throw Pillows! E3 2018 – Ready Player One? Auto Show Season is Just Around the Bend. ©	2000 - 2019	FormDecor.com. All Rights Reserved. Need a Quote for Your Next Fabulous Event?